The Topeak Joe Blow mountain track pump takes the work out of inflating large volume mountain bike tyres, giving you more energy for your ride. The super size barrel diameter means a speedy inflation and the extra long hose gives you a good reach. 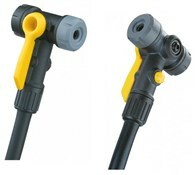 You can use the pump for a variety of valves and the handle has a comfortable grip. Having spent a good few hours struggling to seat a stubborn tubeless tyre, I turned to Tredz to see if there was a more suitable pump avaliable. Luckily, they stock this Toe peak Mountain specific pump! The large volume of the pump easily seated my problem tyre. Handily, the guage on the pump is perfect for the lower pressure ranges required for MTB in comparison to our roadie breathern. The pump works extremely well but it is a little confusing when first using it (my first floor pump) as there are no instructions. Good quality pump designed for MTB tyres lower pressure more volume. I was a little concerned about robustness of yellow lever on connector but this seems fine. Does job quickly and efficiently and feels as if it will last.